Create Users. Users created in Okta will also be created in 1Password. Update User Attributes. Changing a user’s name in Okta will change their name in 1Password. Deactivate Users. Deactivating a user or disabling the user’s access to 1Password in Okta will suspend the user in 1Password. Import Users. Users created in 1Password will be downloaded and turned in to new AppUser objects, for matching against existing Okta users. Push Groups. Groups created in Okta will also be created in 1Password, and group membership changes in Okta will also be made in 1Password. 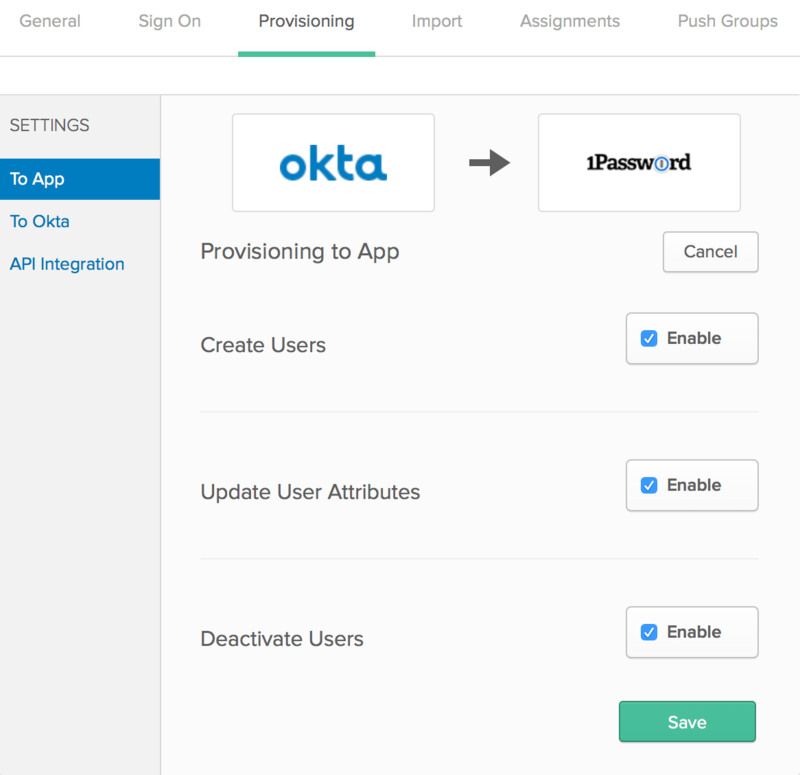 Before you can configure Okta, you’ll need to set up and deploy the SCIM bridge. To get started, sign in to your account on Okta.com , click Admin in the top right, and follow these steps. Click Applications, then click Add Application. Find 1Password Business in the list and click Add. You’ll see the general settings for the integration, including the default application label “1Password Business”. Click Next, then click Done. You’ll see the details of the application you just created. On the 1Password Business application details page, click Provisioning. Then follow these steps. 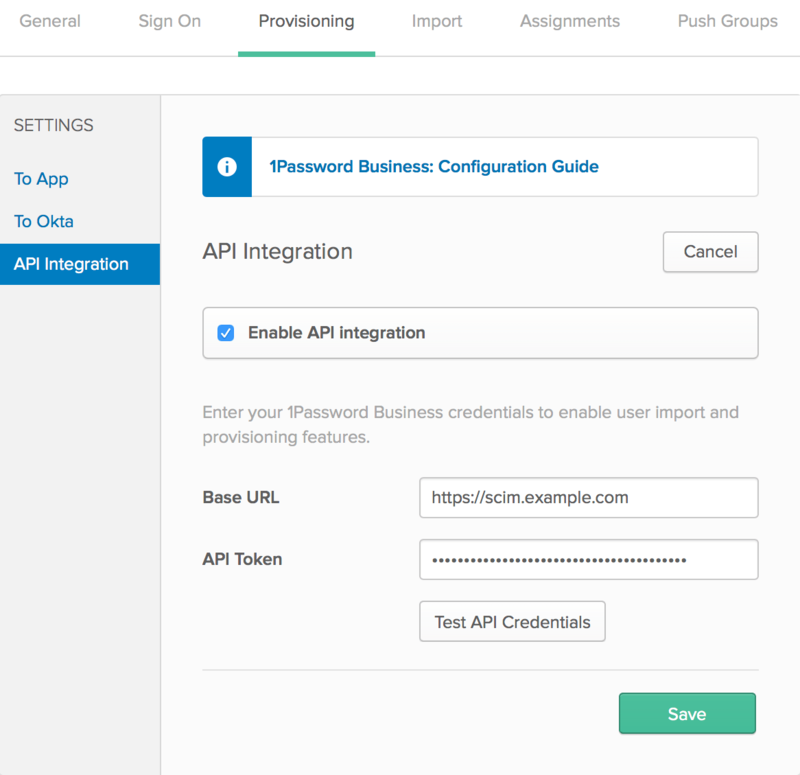 Click Configure API Integration in the sidebar, then turn on Enable API Integration. Enter your Base URL and API Token. Click To App in the sidebar, then click Edit. To manage assigned users and groups, click Assignments. Then click Assign and choose Assign to People or Assign to Groups. To turn off synchronization, click Active and choose Deactivate. Learn more on the Okta Help Center.